Mgr Canon Robert Draper V.G. Some Parish weekday Masses are held in the Convent next door to the Church. See the weekly Newsletter. The Church Office is located in one of the rooms above the Church Hall, accessible from the rear car park: it is open 9.30am to 12.30pm Mondays to Fridays. Telephone: 01935 812021. A weekly newsletter is prepared by the Church Office. It includes forthcoming events in the Parish. Any notices should be given to the Parish Office before noon on Wednesdays. Please click here to view our booklet. In the car park at the rear of the church, but only in the enclosed area. It is helpful if cars are parked nose into the church or the wall opposite i.e. not long-ways. Ideally for those less able (blue badge holders) only. Also on Saturdays and Sundays - In the road on the South side of Westbury i.e. opposite the church. Bill Butters in the SW Business Park also kindly allows use of his spaces there; access is near the railway station, with the parking itself but a moment’s walk from the church. Please be considerate, when parking not to block driveways in Westbury. The story begins with the arrival in Sherborne in 1891, via Bridport and the railway station, of The Religious of Christian Instruction from Ghent. Prior to that, Mass had been celebrated in Cliffe House at the junction of Marston Road; this house, set back into the rock face, still exists. The Mass was celebrated by a priest from Marnhull, where the church dates from 1830. Marnhull’s post Reformation Catholic presence goes back long before these Sisters came to Sherborne. In 1891, the Sisters acquired a large property in Westbury through the agency of a Catholic doctor, Doctor William McEnery. The building was a Sherborne Boy’s School boarding house, though independently owned. Sherborne School was not thriving at the time, so the owner of the house sold it without informing the Headmaster. Details can be found in the official history of Sherborne School. The Sisters also have photographs from this time, and some of the stone tablets in the Church also give details. Immediately on arrival, the Sisters began to build a church that was completed in 1894. The architect was a priest, Canon Scholes, who built many churches in the South of England, including the Holy Ghost Church in Yeovil. Thus the Sisters created a new parish that, for many years, would remain dependent on them. They carried out most of the work associated with the church; cleaning, preparation for services, flowers, music, preparation of children for the Sacraments and moreover paid all the bills! The church was constructed in two parts, the nave for the parishioners and a side chapel for the Sisters. The organ loft was built to be open to both spaces. Originally the church was physically joined to the Convent. The Sisters then set up a school which proved very successful. At the time there was not a lot of competition in providing education for girls in Sherborne. As numbers grew, provision was made for both day and boarding pupils, and annexes were added to the Convent. Part of the Convent itself was also used for boarding pupils. In 1948, Leweston Manor was purchased from Mrs. Rose who kindly offered it at a very reasonable price, and the senior pupils were moved there. In 1991 the Parish and School celebrated the Centenary of the arrival in Sherborne of the Religious of Christian Instruction. The Sisters then generously gave both the church and the priest’s house to the Diocese. St. Antony’s Preparatory School in Sherborne was closed in 1993 and a new Preparatory School was opened at Leweston. Subsequently, the convent and the school buildings were sold to the Diocese, and the Sisters moved into terraced houses in West Terrace, Westbury. Other Sisters later moved from Effingham in Surrey, joining them in 2010. 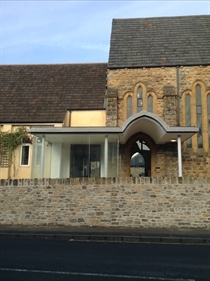 The Diocese resold properties in the 1990s to enable the Parish to build a much-needed hall (1998) and to re-order the church (2000). The early members of the Community who died in Sherborne are buried in the Catholic area of Sherborne cemetery, where there is a monument to their memory. In 1956, a burial ground was provided at Leweston.